TARTAR was built in 1883 by Aitken & Mansel at Kelvinhaugh, Glasgow with a tonnage of 4425grt, a length of 376ft 5in, a beam of 47ft and a service speed of 12 knots. Joining the mail run in May 1883 all her first class berths were located amidships and lit by electric light. Although the carbon filament lights gave little more light than a candle they were, nevertheless, welcomed. She was initially equipped with a compound engine because, although the new triple expansion engine was coming into vogue, few engine builders could handle the conversions which required stronger high pressure boilers. In any case, triple expansion engines were not necessarily faster but more economical. In 1886 she lowered to passage time to Cape Town from Plymouth to 18 days 2 hrs 21 mins and, two years later, lowered the return passage time to 17 days 23 hrs 37 mins. A triple expansion engine was finally installed in 1889 and, at the same time, the funnel was heightened by 10ft and a small promenade deck added at the base of the mizzen mast. On 28th December 1897, together with the Athenian, she was sold to Canadian Pacific for their Vancouver - Skagway, Alaska service. On 5th February 1898 she left Southampton on a passenger carrying delivery voyage to Vancouver via Tenerife, Rio de Janeiro, Buenos Aires and Valparaiso arriving on 1st April. She sailed on her first voyage to Skagway on 28th April but after six voyages and the decline in the gold rush she was laid up. In December 1898, during a voyage from Hong Kong to Vancouver she called at Honolulu, Oahu Island, Hawaii to become the first CPR ship to berth there. 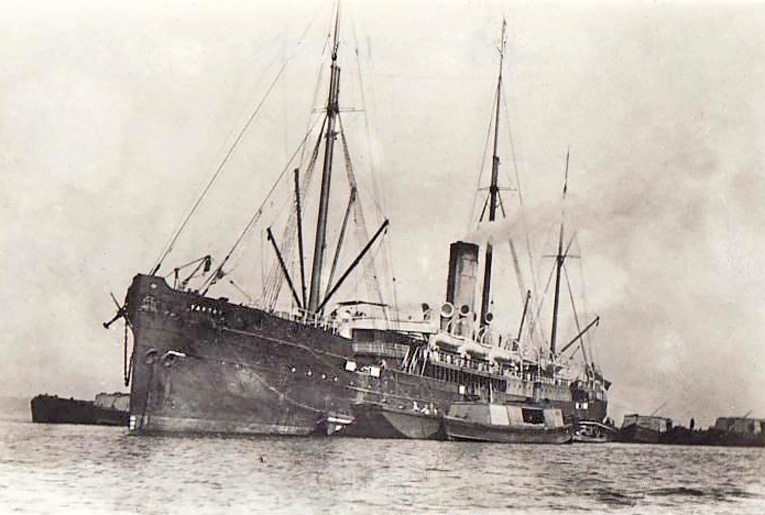 She was chartered to the US Government in July 1899 for service between the USA and the Philippines which had come under American control following the war with Spain during April - July 1898. She reverted to CPR's trans Pacific service in May 1900 where she remained until August 1907 when she was sold to Japanese owners. On 17th October in the same year she collided with CPR's Charmer during a voyage from Vancouver to Japan and had to be beached at English Bay. Laid up locally she was eventually sold to K. Kishimoto in March 1908 and broken up at Osaka.